Let’s say you leave a glass of water out on the counter and forget about it for a couple days. When you come back to that glass of water you will notice that the water level is lower. Why is it that? Assuming that someone else didn’t drink from the glass, the water is disappearing due to evaporation. But you could be saying water isn’t suppose to turn to gas until it reaches boiling temperature, and obviously the glass of water isn’t anywhere near boiling temperature. However, it is still disappearing. This is due to water molecules on surface that have gained enough momentum to overcome the intermolecular cohesive forces to escape as a gas molecule. How fast this happens is related to the vapor pressure of the liquid and the temperature of the liquid. For example if you were to put a cover over the glass eventually the amount of water molecules that are escaping will be equal the amount of water molecules going back into the liquid. Once the water reaches this equilibrium the water level will remain the same. 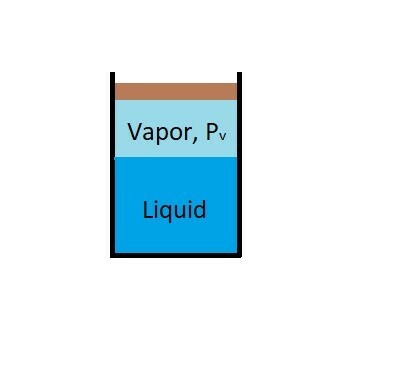 This is because when water and water vapor reaches this equilibrium the water vapor has reached the vapor pressure of the liquid preventing more of it from evaporating. Finally, since vapor pressure is associated with molecular activity. The resulting vapor pressure of particular liquid will be temperature dependent. Generally, the closer a liquid is to boiling the more molecules will escape from the liquid and turn into a vapor. Once a liquid begins to visibly boil, the absolute pressure on the fluid will be equal to the fluids vapor pressure. This is why water will boil at lower temperatures at higher altitudes. At those higher altitudes absolute pressure on the fluid due to atmospheric pressure is less than it would be at sea level. For example if you were to boil water a sea level. We know that it will boil at 100$^oC$ and the vapor pressure will be equal to 1 atmosphere. However, if you were to boil water on the top of Mt. Everest, which is 9.14 km above sea level, it will boil at 69.4$^oC$. The resulting vapor pressure will be equal to 0.30 atmosphere. Due to this fact you can also force a liquid at room temperature to boil by putting it into a vacuum. So why is knowing about vapor pressure important to fluid mechanics. The reason why it is important is because in certain situation when liquid is flowing through a pipe. There could be situations where pressure on the fluid might reach the fluids vapor pressure. If this were to happen the fluid would begin to boil while it is flow through that section of the pipe. When this phenomenon occurs it is known as cavitation. Cavitation can cause structural damage to the pipes walls which could later cause premature failure of the pipe.